It's not too late to "Save Now" and "Label More" with Brady's 30% off promo. But don't delay your order, because this great offer on six popular Brady printers end tomorrow (May 30, 2014). 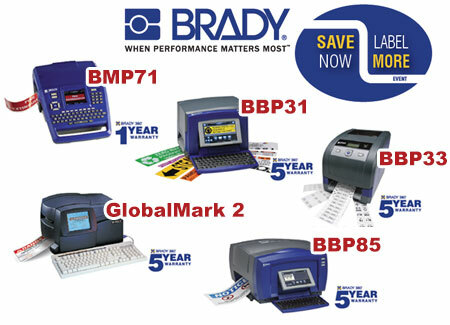 Choose from Brady's rugged BMP®71 Portable Thermal Label Printer ($625.00), the touchscreen-enabled BBP®31 Sign & Label Printer ($1,249.00), the easy-to-use BBP®33 Label Printer ($945.00), the heavy-duty Globalmark®2 Industrial Label Maker ($2,395.00) & Globalmark®2 Multicolor Printer ($1,995.00), and the large-format BBP®85 Sign & Label Printer ($2,795.00). These 30% off prices are reflected on our Web site—no coupon codes to enter—just add them to your cart. Head over to QSource.com today (remember this promo expires tomorrow) to place your order and take advantage of these incredible Brady Printer savings. You may also contact us at 800-966-6020 or via email. See the RELATED ARTICLES section below for previous blogs about Brady Printers.